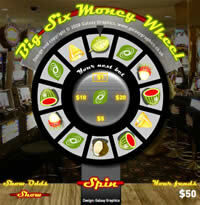 Wheel of Fortune (Big 6) brandable flash game by Galaxy Graphics. Flash Games of chance licensing. The Wheel of Fortune, or Big Six Wheel as it is sometimes called, is an old Carnival game. In real life, the "house edge" for this kind of game is one of the best for the house, or worst for the player. This version is slightly more fair, and gives players a chance to try the thrill of online gambling with no risk whatsoever. The odds of striking a particular symbol can be altered within the code, however, making the game as fair or unfair as you like. This game has been created in order to extend Galaxy Graphics' range of Flash "casino / games of chance", sitting alongside Blackjack, the Tropical Fruit Slot Machine game and the scratchcards. These games are easily rebranded and licenced for your website. Wheel of Fortune source code. Looking for Wheel of Fortune source code and Actionscript? The source code for this game is also available to buy from Galaxy Graphics. Click here to contact us about Wheel Of Fortune Source code.